Where Are You Birding This Third Weekend of January 2010? We’re three weekends into the new decade and I’m wondering how many well-intentioned resolutions have already been cast by the wayside. How many of you have become the healthier, happier selves you imagined you could be? Are you at least sticking with your pledge to enjoy nature more? If you haven’t yet, you should consider living your best life NOW! Where will you be this weekend and what birds will you be looking for or at? Share your plans in the comments below. Since bitter cold and better football kept me indoors last weekend, I really need to get out for some quick photography practice this weekend if I want to be ready for my big trip next weekend. Corey will get plenty of practice taking photos in icy, unstable, chum-laced conditions as he embarks on a New York pelagic in search of alcids. Charlie will probably choose the better part of valor and wait the foul weather out! 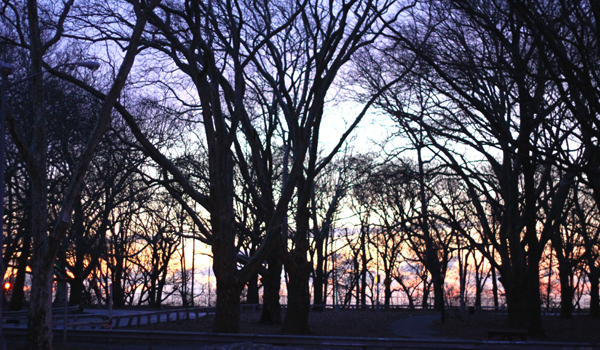 Dawn breaks over the Ridgewood Reservoir in Queens; the trees aren’t out of focus… they’re shivering! I, too, will be pelagicizing. Heading out to Lake Mattamuskeet NWR with the Young Naturalist’s Club. Lots of waterfowl on the agenda and perhaps another attempt at my nemesis Black-headed Gull. Family holiday near the German Alps. Keep your fingers crossed for a Wallcreeper, a species I’d call one of my Nemesis birds if it wasn’t far too beautiful for that. One tends to forgive a greyish bird with pink wings a lot of dips, you know? Assuming it doesn’t rain all weekend–which looks possible–I’m staying local so I can stake out a city park where a male/female pair of northern harriers are hunting. And if the cosmos smiles on me, they’ll be my best birds of the weekend. Love color behind the silhouetted trees! Looks like a old park, and i liked the colourd sky behimd it. New Orleans! Where it will be reeeeeally wet. Lock and Dam 14 and Lock and Dam 15 will be full of Bald Eagles! Thick for in Delhi, but if it clears a bit will head to Sultanpur jheel tomorrow for some birding and some bird photography.